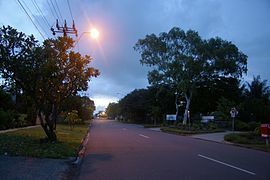 Larrakeyah is an inner suburb of Darwin, the capital city of Australia's Northern Territory. Larrakeyah is named after the indigenous language group that has occupied the area since before European settlement, the Larrakia, who occupied much of the Darwin coastal area. Development of the suburb originated in the late 1800s when the Botanic Gardens were created, with further development in 1911 when Myilly Point in Larrakeyah was established as a residential area for senior public servants. On 19 February 1942, 2 attacks occurred on the Larrahkeyah and Darwin harbour which resulted in a war on the area of Darwin waterfront, Darwin city and Larrakeyah. The Japanese won the war of Darwin harbour but soon retreated with 250 people dead and another 300 injured. After all of the madness, Darwin harbour and Larrahkeyah was rebuilt with new buildings and the new Navy imported from Perth and Sydney. Features of Larrakeyah include the Larrakeyah Barracks (an Australian Defence Force barracks that includes HMAS Coonawarra Naval Base) that takes up most of the suburb, Larrakeyah Terrace (a pleasant harbour-front street with an open park for picnics and walks), as well as being close by to the tourist attractions in Darwin City, Cullen Bay, Mindil Beach and the George Brown Botanical Gardens. Larrakeyah is now a densely populated suburb, home to an increasingly diverse population of long-time locals, indigenous and transient residents who have come to Darwin to work during the cooler dry season. It is located within the federal electorate of Solomon and the territory electorate of Port Darwin. ^ Australian Bureau of Statistics (27 June 2017). "Larrakeyah (State Suburb)". 2016 Census QuickStats. Retrieved 28 June 2017.